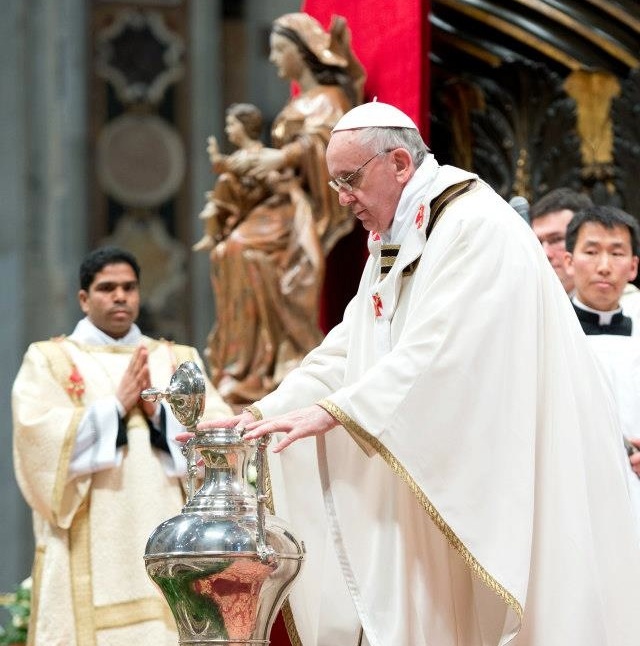 “A good priest can be recognized by the way his people are anointed.” Pope Francis said in homily given in the Chrism Mass in St. Peter’s Basilica in the morning today. 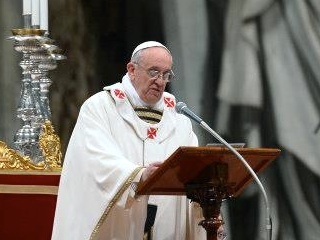 “We need to go out, then, in order to experience our own anointing, its power and its redemptive efficacy: to the outskirts where there is suffering, bloodshed, blindness that longs for sight, and prisoners in thrall to many evil masters,” the Pope continued with words so familiar to us. And finally shaped what priests, whose day is today, should be: “…shepherds living with the smell of the sheep, shepherds in the midst of their flock, fishers of men.” Read the full text of the homily. The readings of our Mass speak of God’s anointed ones: the suffering Servant of Isaiah, King David and Jesus our Lord. All three have this in common: the anointing that they receive is meant in turn to anoint God’s faithful people, whose servants they are; they are anointed for the poor, for prisoners, for the oppressed A fine image of this being for others can be found in the Psalm: It is like the precious oil upon the head, running down upon the beard, on the beard of Aaron, running down upon the collar of his robe (Ps 133:2). The image of spreading oil, flowing down from the beard of Aaron upon the collar of his sacred robe, is an image of the priestly anointing which, through Christ, the Anointed One, reaches the ends of the earth, represented by the robe. From the beauty of all these liturgical things, which is not so much about trappings and fine fabrics than about the glory of our God resplendent in his people, alive and strengthened, we turn to a consideration of activity, action. The precious oil which anoints the head of Aaron does more than simply lend fragrance to his person; it overflows down to the edges. The Lord will say this clearly: his anointing is meant for the poor, prisoners and the sick, for those who are sorrowing and alone. The ointment is not intended just to make us fragrant, much less to be kept in a jar, for then it would become rancid and the heart bitter. A good priest can be recognized by the way his people are anointed. This is a clear test. When our people are anointed with the oil of gladness, it is obvious: for example, when they leave Mass looking as if they have heard good news. Our people like to hear the Gospel preached with unction, they like it when the Gospel we preach touches their daily lives, when it runs down like the oil of Aaron to the edges of reality, when it brings light to moments of extreme darkness, to the outskirts where people of faith are most exposed to the onslaught of those who want to tear down their faith. People thank us because they feel that we have prayed over the realities of their everyday lives, their troubles, their joys, their burdens and their hopes. And when they feel that the fragrance of the Anointed One, of Christ, has come to them through us, they feel encouraged to entrust to us everything they want to bring before the Lord: Pray for me, Father, because I have this problem, Bless me, Pray for me these words are the sign that the anointing has flowed down to the edges of the robe, for it has turned into prayer. The prayers of the people of God. When we have this relationship with God and with his people, and grace passes through us, then we are priests, mediators between God and men. What I want to emphasize is that we need constantly to stir up God’s grace and perceive in every request, even those requests that are inconvenient and at times purely material or downright banal but only apparently so the desire of our people to be anointed with fragrant oil, since they know that we have it. To perceive and to sense, even as the Lord sensed the hope-filled anguish of the woman suffering from hemorrhages when she touched the hem of his garment. At that moment, Jesus, surrounded by people on every side, embodies all the beauty of Aaron vested in priestly raiment, with the oil running down upon his robes. It is a hidden beauty, one which shines forth only for those faith-filled eyes of the woman troubled with an issue of blood. But not even the disciples future priests see or understand: on the existential outskirts, they see only what is on the surface: the crowd pressing in on Jesus from all sides (cf. Lk 8:42). The Lord, on the other hand, feels the power of the divine anointing which runs down to the edge of his cloak. We need to go out, then, in order to experience our own anointing, its power and its redemptive efficacy: to the outskirts where there is suffering, bloodshed, blindness that longs for sight, and prisoners in thrall to many evil masters. It is not in soul-searching or constant introspection that we encounter the Lord: self-help courses can be useful in life, but to live by going from one course to another, from one method to another, leads us to become pelagians and to minimize the power of grace, which comes alive and flourishes to the extent that we, in faith, go out and give ourselves and the Gospel to others, giving what little ointment we have to those who have nothing, nothing at all. A priest who seldom goes out of himself, who anoints little I won’t say not at all because, thank God, our people take our oil from us anyway misses out on the best of our people, on what can stir the depths of his priestly heart. Those who do not go out of themselves, instead of being mediators, gradually become intermediaries, managers. We know the difference: the intermediary, the manager, has already received his reward, and since he doesn’t put his own skin and his own heart on the line, he never hears a warm, heartfelt word of thanks. This is precisely the reason why some priests grow dissatisfied, become sad priests, lose heart and become in some sense collectors of antiques or novelties instead of being shepherds living with the smell of the sheep, shepherds in the midst of their flock, fishers of men. True enough, the so-called crisis of priestly identity threatens us all and adds to the broader cultural crisis; but if we can resist its onslaught, we will be able to put out in the name of the Lord and cast our nets. It is not a bad thing that reality itself forces us to put out into the deep, where what we are by grace is clearly seen as pure grace, out into the deep of the contemporary world, where the only thing that counts is unction not function and the nets which overflow with fish are those cast solely in the name of the One in whom we have put our trust: Jesus. Dear priests, may God the Father renew in us the Spirit of holiness with whom we have been anointed. May he renew his Spirit in our hearts, that this anointing may spread to everyone, even to those outskirts where our faithful people most look for it and most appreciate it. May our people sense that we are the Lord’s disciples; may they feel that their names are written upon our priestly vestments and that we seek no other identity; and may they receive through our words and deeds the oil of gladness which Jesus, the Anointed One, came to bring us. Amen.